Preheat oven to 375 degrees. Line a baking sheet with foil and spray lightly with cooking spray. Combine strawberries, sugar and cornstarch in a bowl and toss to coat. Set aside.Lay one sheet of phyllo on baking sheet. Spray liberally with cooking spray. Sprinkle very lightly with sugar. Lay second sheet of phyllo on top of first and spray with cooking spray.Pile half of strawberry mixture on one end of phyllo dough, several inches from the short end. Fold over and roll (like a burrito), folding in ends as you go, until completely rolled up, seam side down. 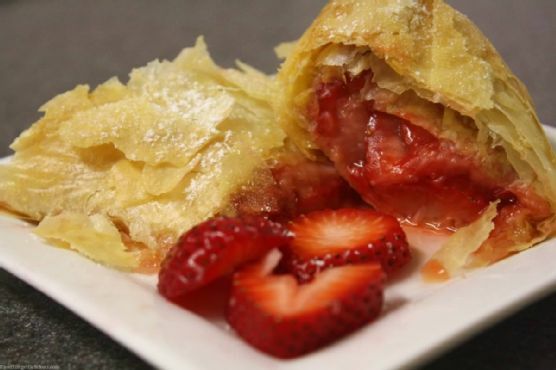 Spray outside of strudel and sprinkle lightly with sugar.Repeat with remaining phyllo and strawberries. Strudel can be paired with Cream Sherry, Moscato d'Asti, and Port. A common wine pairing rule is to make sure your wine is sweeter than your food. Delicate desserts go well with Moscato d'Asti, nutty desserts with cream sherry, and caramel or chocolate desserts pair well with port.